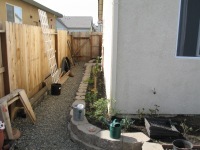 This new development property in Woodland, CA entailed a full installation of the back landscape. The soil was completely trashed by construction workers when building the house. 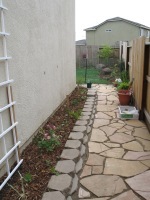 By adding an enormous amount of compost and mulch as we worked we were able to nurture it back to health. 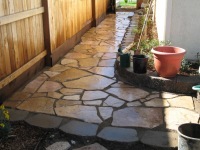 The small space was limiting but we were able to install flagstone pathways and retaining wall beds, a flagstone patio off the back door, a vegetable garden in the south facing corner (not pictured), a drip irrigation system for all gardens, perennial plants and herbs along the fence. 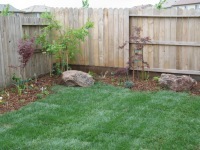 Fruit trees and berries were also planted and a small amount of turf for playing and relaxing. 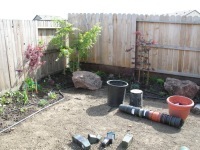 The north facing corner was planted in shade tolerant plants and trees including a Japanese maple.